The LT1213 LT1214 will operate on any supply greater than 2.5V and less than 36V total. 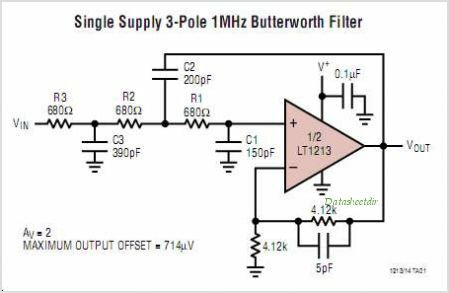 These Amplifiers are specified at single 3.3V, single 5V and 15V supplies, and only require 2.7mA of quiescent supply current per Amplifier The inputs CAN be driven beyond the supplies without damage or phase reversal of the output. The minimum output drive is 30mA, ideal for driving low impedance loads. Note: For applications requiring higher slew rate, see the LT1215 LT1216 data sheet. For lower power and lower slew rate, see the LT1211 LT1212 data sheet. This is one package pinout of LT1214,If you need more pinouts please download LT1214's pdf datasheet. 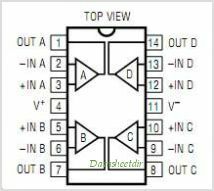 This is one application circuit of LT1214,If you need more circuits,please download LT1214's pdf datasheet.